Pilots training in Scotland for a commercial licence are being given the opportunity to fly training flights to almost every airport in Europe - without having to leave the ground. They're being given access to one of the most sophisticated flight simulators in the world, which not only speeds up their training but cuts down the cost. The system costs £200,000 and is now up and running at Tayside Aviation in Dundee. 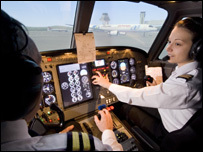 The only full-time pilot training course in Scotland is run by Glasgow School of Nautical Studies. They're now sending their students to Dundee after their theory training to take full advantage of the simulator. Head of Aviation Training at the college, Kevin Maloney, said it lets them put that theory directly into practice. He added: "This makes a vast difference to the whole training package. "They can come and see how the aircraft performs and familiarise themselves with the instrumentation that we talk about in the class." The system, designed in France, allows the trainers to simulate 22 different types of aircraft and can replicate almost every type of weather condition imaginable. Not only that, it means pilots can get in valuable flying hours even if the weather outside is completely unsuitable. Another major benefit is the ability to stage realistic emergencies. Tayside Aviation managing director Jim Watt said: "From the computer screen we can set up various failures in the engine or the electrics or perhaps the undercarriage. "So, we can do much more in the simulator than we can in the aircraft. "We can even have the engine go on fire if needs be, so it's much more beneficial in training terms to be able to fail so many things that you really wouldn't want to do in a real aeroplane." And while actual flying can burn up 10 gallons of fuel an hour, this is much more environmentally friendly, cutting down on the carbon footprint. There's also a major cost benefit at a time when there's a growing demand for commercial pilots across Europe. Getting a commercial licence can cost about £50,000 - however, using the simulator can cut that to about £30,000. Pilots still have to put in the requisite number of actual flying hours but the "extra hours" in the simulator can speed up the training process.